Here are some of the most frequently asked questions regarding Agriberry Farm’s CSAs. What's in a Weekly Share? Anything else we discover along the way that’s really delicious! During the first few weeks of the CSA, when strawberries are the only fruit available, we will include some early season asparagus or tender spring sugar snap peas in your shares. Want to know about some of the additional benefits of the CSA program for members, the farm and the community? What about vacations and emergencies? Vacation planning varies by CSA location, so please be sure you understand how to schedule your time away. In general, with a little advance notice, you can schedule a skip/make-up for any remaining delivery week of the CSA season. Options for handling emergencies also vary by region, and your CSA coordinator will work with you to the fullest extent possible, but refunds will not be provided for missed shares. A few more great questions! When does the CSA start? As soon as we are harvesting enough strawberries each day to fill the CSA shares, we will begin distributions some time between late-April and early May. Watch for email notifications of the actual start date. How many different pickup locations can I have? We ask that you select a single pickup site for the season at the time of registration. If your schedule changes during the course of the season, you can switch to a different site on a short term or permanent basis. We understand that schedules can vary–sometimes without much warning–and we try to offer you as much flexibility as possible, but options for changing locations vary by CSA region. Please check with your CSA Coordinator for additional details. Payment options vary by CSA region as well, but Richmond and Annapolis CSAs accept checks and credit/debit card payments in addition to cash and checks. New for the 2019 season, the Richmond-area CSA has added payment options via the new “HARVIE” registration system. May I join once the season has started? Absolutely! Once the season has begun, we add members as space permits, and costs are pro-rated based on the number of remaining weeks. Where does the fruit for the CSA come from? 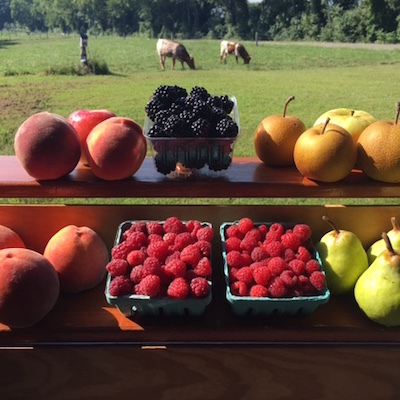 The fruit included in the Agriberry Farm CSA is grown by Agriberry Farm in their fields, or is grown by other family owned and operated farms in the mid-Atlantic region, which are carefully selected by Agriberry Farm. These family-owned and operated Partner Farms are chosen by the Geyers based on their multi-generational involvement, the quality of the fruit they grow, and the safety and sustainability of their practices. The family appreciates the trust you place in them to make those choices. Do you allow split shares? Sure! If you wish to team up for a share, we ask that you designate a “primary” member–usually the one that initiates the registration–under who’s name the share will be listed for pickup. The details and logistics for splitting your share (alternating weeks, dividing each week, etc.) are up to you!